“Should I wear a string so I don't get lost?” I said. “Perhaps we need to get some of that rope from Katje,” I said softly. I was finding it easier to speak now, for some reason. My chest no longer felt 'tight', and I could breathe much easier. I seemed to have slept for a week, I felt so much better – and when Katje returned with my cup and a jug, I began to drink, this slowly with the small and limp-seeming 'straw' that extended from part of the mask and into my mouth. “Broom?” I asked. For a moment, I wondered why I needed to take it. Sarah proved to be absolutely correct, for with a surety now strange beyond all knowing, I homed in relentlessly on my goals of first collecting a sample of tungsten and then 'killing' the rest of the nasty stuff. Faintly – and somewhat tinnily – I could hear screams and thunderous roaring noises as I 'shouldered arms' again and again, and when I had 'cornered' my prize – that one sizable sack of true-mule skin filled to bursting with 'first quality Wulfræmë' – I found that it had been joined by several like it. I motioned one of the obscenely-bulging sacks into a sample bag, and while it went inside readily enough, I could tell that skin of a long-dead true-mule wanted no part of someone like me. The pouch in question suddenly lost a good deal of 'apparent' mass, and I looked inside it. To my eyes, the blackish-blue grains of irregular-looking 'shot' somehow seemed 'cleaner' than before, and as I bagged up the remaining true-mule-skin pouches and their 'smelly' contents, I asked each time that the mule-skin pouches clog the throats or sinuses of witches. “Not just those people choking or developing sudden 'sinus infections'?” I asked. The sudden explosive thunder of roaring flames peaked abruptly to then vanish in a series of earth-shaking thuds – the last of which nearly tossed me onto my rear – and I looked around. Lights, these seemingly distant, moved in purposeful fashion, while my own lantern lay beside me on the floor. I'd filled five sample pouches full of tungsten shot, and each weighty pouch now made for alarm at its surprising heft. “And at the Abbey?” I thought. I knew they'd need to 'pick up' the stuff before they did much else here. I now went on the hunt after a cart, and once I'd gotten my samples back to where the others were gathering up things near where I'd been put into the suit – or rather, suite – I went out after more tungsten, this time with the goal of 'extirpating' it. I seemed to know exactly where the surviving material was hiding itself now, and with a steady walking pace, I 'fired' at each windrow of accursed wolfram I found as I 'chased it down'. I kept my 'bursts' short, but the tinny rattle of empty shell casings forming wide-spreading mounds to my rear was a near-steady tinkling refrain – and when I cornered the last of the loose material, this near those huge 'containers' where I suspected suite testing was done with 'stink bombs', I 'lit it up' with a raking burst that coalesced the stuff into three substantial-looking foot-long ragged-edged bars glowing with 'heat'. “Uh, where is it?” I asked. No, wish was not the word. If these places were open, they'd need to settle themselves down very quickly indeed, and a stink-bomb or three in each drink-house sounded like a capital idea. “What were those?” I asked. “Will we use those gases?” I asked. As I bagged up five of the 'stink bombs', I asked, “what would that be?” I then realized one possibility: fumigation of pirates while sailing past them at speed. I moved back to the east and south, this time with trepidation, and when I came upon Sarah, she was indicating just how many of the white plastic jugs were needed. “Yes?” I asked. There was more. I could feel it. “Not many words, just pictures in that part?” I asked softly. A pause, this one pregnant beyond all possibility. “Those secrets got out eventually, didn't they?” I asked. My voice was a soft muttering, this between breathing deeply. The last, for some reason, made no sound at all, thankfully. I did not wish to sound like one particular black-dressed 'witch' of recollection – though just where this 'witch' came from and what he did was yet an entire mystery beyond my recalling his dread existence in certain movies, and the only part of his particular nature that I remembered clearly was his breathing noises. “Which we will learn in due time, no doubt,” I murmured. Again, my voice was very soft, with a thickened muffled sound, and when I felt my head, I noted soft rounded contours that seemed to cover my ears. I wondered for a moment if they had diaphragms that permitted such ready hearing, until I recalled just what had been put on my head – and a smallish rechargeable battery had been needed, also. As I moved to where Karl was – he had three machine-pistols and a hand-howitzer pistol on his cart, as well as what looked like three square tins of ammunition and a large pile of assorted magazines that looked to need at least one bag the size of Sarah's satchel – I noted an unusual-looking stack, this one but chest-high and looking to have been heavily looted. I reached up and into its center to find a sizable camouflaged pouch, and as I continued moving in Karl's direction, broom in one hand and the pouch now in the other with my lantern in my 'pouch-hand', I wondered just what I had found – and more, what Karl had found. I laid my broom down against his cart when I came to find the 'ammunition can' open wide and Karl pointing at its label with a shaking finger – which then he moved from the can to the front of my broom. “They were killed by those people the same day,” said Karl – who then opened the container. I looked at the plastic-laminated 'picture', then thought to look in the bag I had 'looted'. The first thing – a 'manual' as thick as two of my fingers – I took out of the bag showed a plastic-embossed picture on its front of what the plastic-laminated 'cardboard' picture was actually describing with pictures and words. “What is it?” asked Karl – whose question was then echoed an instant later by Sepp. “Why, did they work well for radio use?” I asked. “How high?” I asked. I was thinking in the region of three hundred to six hundred ohms. The headphones in question had a nominal impedance of 64 Ohms per side – and they were not cheap. I'd spent more on that pair than the combined cost of the three pairs previously bought – and none of those were 'cheap' either – though the last pair I'd bought made them sound 'cheap' and held up far better than any of the earlier ones. “Has a close copy of what's used,” said the soft voice. “It isn't quite as good for either sensitivity or fidelity, otherwise that radio could have performed significantly better.” A pause, then, “look closer at first that card, then at the phone itself, and finally at that manual. “Then how does it, uh, amplify and f-filter the signal?” I asked. I turned to the page in question, this showing on the first three pictures what looked like more or less common 'fires' and 'smoked' parts similar to some I had seen long years in the past, but the fourth picture – the one indicated – took up half the page. Karl came alongside of me as I looked close at the picture, this a scene of such havoc that I wondered what kind of a bomb or shell had caused it. “An amplifier board's output was overloaded with a direct, uh, short,” I muttered, “and it was 'fed' with a fresh battery.” Pause. “Three people died at the scene, and four others were severely injured.” Another pause, then, “that must have been some amplifier to do that much.” I then asked a question. “D-detonating c-chip collection?” I asked. “What?” I squeaked. I could feel a trace of feedback occurring, and it made my voice yet higher-pitched with faint squealing overtones. “There will be one of those for the man who was stung to death, also,” said the soft voice, “as he'd just murdered his way into his position not over two weeks ago, and hence he had no chance to get 'set up' with a retinue.” The unspoken portion was 'he'd killed them before he got the chief witch, and hence he'd need to recruit all of 'his' people' – which was not something a Power did overnight. “Snake?” said Karl. I could tell he was not thinking kindly of this information, as I suspected he 'knew' which snake was being spoken of. “Then what is this..?” She indicated the respirator. “I fainted?” asked Sarah. Again, her voice was altogether muffled. “Did she wear black stuff?” asked Karl. “Why would someone like a preacher eat the flesh of swine?” asked Maarten. “Did this beer have a name?” I asked. “Mud?” I asked. “Weeds? Beer?” I had a vague recollection of someone who might have fit the description, and what came to me was so outlandish that I thought it beyond comprehension. I blurted it out anyway. “L-Lucy?” I asked. It was a very strange coincidence, especially in this language – as it came out 'Luytje' or 'Loo-it-yee'. “How did she say that name?” I thought. I'd never heard it spoken here, though if anyone would know of uncommon names, Sarah would be as likely as anyone. “Series?” I asked. Again, this was silent, even as my eyes shot over the manual's pages and I turned them quickly, much as if the individual pages were in the grip of a hurricane. My reading speed while able to breathe properly was stunning – stunning to me; and I suspected, the others. The precise nature of the handset, this being of forged and anodized titanium. While the word used for 'anodized' was clear enough to me, I suspected this process wasn't 'anodizing' as I understood and had practiced it with small pieces of aluminum, but a far more complex process that gave a thicker, tougher, and more variable finish. More important, the green color wasn't a matter of dye, but of PH, time, electrical current density, and a good deal else the manual didn't go into – even if it did go into sufficient detail that I could potentially duplicate the process given the need, the time, and the equipment to do so. Most importantly, the handset's parts were all of titanium, save for those portions that needed to be otherwise; this included the 'spit and dust' screens, these of titanium – and serving to permit the clear passage of sound while excluding water, dirt, and nearly everything else. “Do we have..?” I thought. I laid down the manual, took up the 'map', and 'leaped' into the maze. I could hear speech behind me, then soft steps moving with surprising speed. Within seconds, I turned, map still in hand, and saw Sarah. She'd removed the equipment somehow, and held two lights, one in each hand, with one of those odd-colored camouflage 'satchels' on a shoulder strap. “Not as much as you are,” said Katje's voice. I had no idea how she'd managed to speak so clearly, until I saw the nature of my 'string' laying on the floor. “What did she mean by 'bad for its words'?” asked Sarah as I led off once more, my 'leash' slowly paying out from the 'spool' she spoke of being present on my waist. “Speaking through a horn?” I asked. “Which include musical instruments?” I asked. “Do they get anything out of it?” I asked. “Didn't have a clue as to what they were doing,” I muttered – and then regretted saying so a second later when I heard the truth. “You walked right to it,” said Sarah. “Now is this...” She looked closer, then plopped the box on the floor. To her credit, Sarah did not open it, but turned to me as I did the same thing with my second box. “And that gas got all of them, didn't it?” I asked. “Fenny-snakes,” I muttered, as I took down another can. “They didn't call them that,” I muttered – though then the thought recurred to me. I shook it off. “Hence a fair number of those people died of snakebite,” I muttered, as I removed another ammunition can. I could now look inside the 'cache', and saw a mound of bags and boxes, the bags camouflaged in the 'usual' pattern and lumpy with 'loot'. Some I could see were the size of what Sarah was using, while others were larger, and I had a distinct impression: not only was all of this stuff important to our immediate efforts, but the witches had nicely bagged it up for us. I instinctively knew to not go any further with that one, as when I turned around, Sarah had gone. By the noise of her fast-retreating steps, she was off to fetch a cart, and by the time I'd cleared enough ammunition boxes to readily touch the upper bags in the 'witch-pile' – I almost wanted to call it a witch-pie', as in that one novel that had provided the idea for the hair-ball had spoken of such a thing – I could hear the faint noises of at least two carts coming back for the 'loot'. “More deliberate mislabeling?” I asked. “Are they the ones who know about hiding?” I asked. “Are they vulnerable to fetishes?” I meant those of the Valley. “As in, uh, melt it down or put it in manure-piles?” I asked. And when I next turned with a box of ammunition, I could see the first cart coming. I had misjudged their number, for there were three of them, each drawn by a lantern-holding individual – and all three of them had found dropped weapons or magazines and put them on the carts, if I went by their somewhat irregular progress. Sarah put two of the ammunition cans on the cart, then nodded before speaking. “If this stuff here starts fires, then I think we may wish some for the trip, as I doubt those thugs will enjoy being set alight by such bullets, and I suspect that to be true for the ones around here who will show in coaches within a week or so.” Katje then arrived, with Karl just behind her. Both had found more weapons and magazines, and I was suspecting Sarah was indeed correct regarding our current need of weapons. “A week?” I asked. We'd be gone by then, or so I suspected. Then again, however, there would be coaches we would see during our trip – and they'd get some gunfire at the least if we were able to shoot. Karl had the third cart, however, and he was silent, even as he put a fourth ammunition box on his cart. He then began moving those cans Sarah and I had stacked so they were out of the way. “Was this to make their mixtures behave?” asked Sarah. With the first cart becoming full, it was towed off by Katje and her cart replaced it. Sarah remained handy, as did Karl; and while Sarah was 'looking' at the bags and other things I handed her, Karl was replacing some of the boxes on the other side of the stack so as to make less trouble for further exploration. The fact that he had figured that out without me speaking a word on the matter was especially heartening, even when Sarah told me she'd given him 'something of an idea' as to what might prove wise. “They do, or so they think,” said the soft voice. “There are some very old – so old they're more or less undocumented – data paths into their 'main stores'; and then, there's what the interface people have copied 'for ready reference' on their computers. “Some of that stuff's got to be off-line, though,” I said. That comment put a stop to such thinking, and then I knew one reason as to why: I'd found something so strange that I wondered utterly as to what it might be. It looked like a strange spike of some kind, and when I passed it to Sarah, she began muttering worse than I'd ever heard her do so. “No, even if there are things those spikes will fit in here,” said the soft voice. 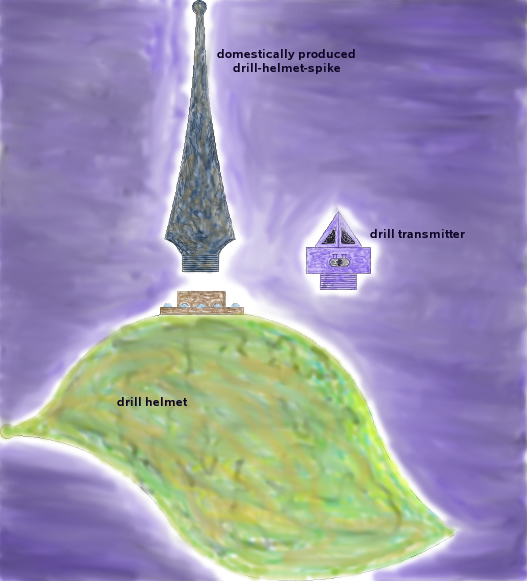 “That one witch made a lot of copies of those helmets when he got this shipment in, and then he also had those spikes made to fit in place of the drill transmitters that normally went in their sockets.” There was a question in my mind – why did that one foul-smelling witch make a lot of copies of less-than-good pieces when they weren't up to the rigors of combat – but now was not the time for asking it. “Uh, why?” I asked. I had the impression such things weren't going to help us much in our battles. “Even the 'cheap junk' from around here was better than what they could produce then,” I muttered, upon recalling what I had heard about Norden's metalworking capabilities growing since Thinkers became 'common' enough to actually make a difference. “Was it really hard to get lead up into this way fifty years ago?” I wondered if Sarah's sources were accurate, as I knew about at least one king in the first kingdom who tried to become a witch in 'recent' years, and I doubted much he was the sole instance during the period of the Annals Sarah spoke of. “That is for doing up bad shot so it is fit for round-bullets,” said Karl, as I began to fill his cart. Sepp had come and retrieved the cart Katje had brought, and I could hear 'work' going on somewhere behind me as the carts were being unloaded and their goods being 'piled' in a semi-sorted fashion. More, I suspected Katje was looking over some of the nearby pallets to see what was in them. “Closer?” I asked. I could see what looked to be the bottom of the cache, and the nature of the pallet itself was becoming plain – as not merely was it not metal, but it wasn't wood either. I wondered what it was, in fact. Sarah had no answer, and I could not think of one beyond the obvious one that occurred to me. Karl, however, spoke for the two of us.